- Project Management: The Managerial Process is distinguished by its balanced treatment of both the technical and behavioral issues in project management as well as by its coverage of a broad range of industries to which project management principles can be applied. 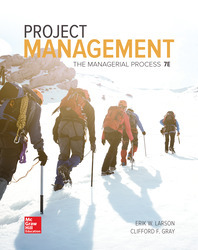 - This text not only delivers the tools and processes is essential to successful project management but also an understanding that the effectiveness of these tools and methods are shaped and determined by the prevailing culture of the organization and interpersonal dynamics of the people involved. - Larson/Gray presents a holistic view that focuses on methodology as well as the human dimension and how they interact to determine the outcome of projects.